Outgoing Rep. Dennis Kucinich: With 2 Parties Failing U.S., It’s on Us to Build a “Culture of Peace” | Democracy Now! Democratic U.S. representative from Ohio, serving his last week as a member of Congress. StoryNov 07, 2012Jeremy Scahill and Dennis Kucinich: In Obama’s 2nd Term, Will Dems Challenge U.S. Drones, Killings? JUAN GONZÁLEZ: While the so-called fiscal cliff has dominated the news headlines, the Senate is also preparing to vote today to continue a controversial domestic surveillance program. In a blow to civil liberties advocates, the Senate rejected three attempts Thursday to add oversight and privacy safeguards to the Foreign Intelligence Surveillance Act. AMY GOODMAN: Dennis Kucinich is still with us, outgoing Democratic congressmember. This will be his last week in Congress—at least for this term of his political life. 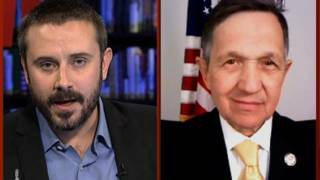 Congressmember Kucinich, the issue of FISA—what is this bill? What does it mean? REP. DENNIS KUCINICH: Well, what it reflects is a breakdown in trust in this country. The attempt is to give the government even more powers to spy, and that is really being translated into domestic, quote-unquote, “intelligence,” even though it’s called the foreign intelligence bill. We have to ask questions. You know, why, for example, was—did you have the Occupy Wall Street movement being spied upon? What is this? What’s going on in our country, where we don’t have oversight of the activities of the government when it comes to domestic spying? And what are we doing in America, where the privacy concerns of Americans are swept aside? We’re entering into a brave new world, which involves not only the government apparatus being able to look in massive databases and extract information to try to profile people who might be considered threats to the prevailing—to the status quo. But we also are looking at drones, which are increasingly miniaturized, that will give the governments, at every level, more of an ability to look into people’s private conduct. This is a nightmare. And the FISA bill is just one example of how America is going in a direction that undermines the expectations of not just the right to privacy, but the right to be free of unreasonable search and seizure, the demand that any action that’s taken to get information about people should be subject to a warrant, that it not be subject to just any FBI agent determining that this is information they want on that person. This is bad news. AMY GOODMAN: Congressmember Kucinich, not just what do you say to your natural opponents, the Republicans in Congress, but to your allies, Democratic congressmembers, who you almost, in many of these cases, from drones to FISA, oppose as much as the Republicans? What message do you have for them as you leave Congress? REP. DENNIS KUCINICH: Well, actually, you know, we’ve seen a bridge here created between Democrats and Republicans on the issue of liberty and being free from the all-seeing eye of Big Brother. Congressman Paul and I worked together on many of these issues relating to the government seeking increased powers to surveil the American people. You know, it’s really no longer a Democrat or Republican issue. It goes much deeper than that. And in a way, Amy, these debates that we’re having right now in Washington show the limitations of our two-party system, that the two-party system itself is failing the American people, that there really aren’t enough choices, of not just individuals, but of policies reflecting the direction America should go in. When we find in a post-9/11 America that we are mired in a condition of fear; when we see the massive amounts of spending that’s gone for war and increased military buildups and for expansion of spy agencies like the Domestic Intelligence Agency, which is just adding another 1,600 spies so that the Pentagon can have their own spy agency to compete with, what, the CIA abroad; when you see the interventions that have fallen flat and have been disastrous, such as Libya and Benghazi; when you see al-Qaeda growing in strength because of our own misapplication of force, you have to ask, if this is about Democrat and Republican, this system is failing. And we’re seeing an evidence of it on fiscally, but we’re seeing another evidence of it in foreign policy, and we’re seeing an evidence of it domestically, when you can see a surveillance state arising under the noses of both political parties. AMY GOODMAN: You talk about your alliance with Ron Paul. Both of you are leaving. This is your last days in Congress, at least this time. So who are your successors, who you see in Congress right now, who will carry on these struggles for privacy, against drones? REP. DENNIS KUCINICH: Well, you know, I would hope that people who I’ve worked with in the past, like Barbara Lee, Alan Grayson and others, would continue the efforts. You know, there are people on both sides of the aisle who have expressed concerns. You have to remember that we put together a very powerful coalition in challenging the war in Libya that was a coalition between Democrats and Republicans, that reflects a new concern about where is America going. Why are we letting the president or the White House determine that we should expand war? We don’t even involve Congress anymore. I think that you’re going to see, you know, a continued effort. The question is the strength of it. And the question is, as a function of the work of political parties, why political parties have essentially been outside of this debate over civil liberties. Why have the parties watched as there’s skirmishes that go inside Congress that really are not emboldened by the support of either side of the aisle in some official party structure? That’s what I’m saying. You know, as we look towards a new year, we may be looking at two things. Number one, within each party, you may see more primaries. So, you know, we may see people decide that instead of being independents, they want to be party animals and bring the challenge right inside the Republican and Democratic parties. Or, on the alternative, you may see a third political wave movement that arises from disgust with the inability of parties to address the economic aspirations of the American people. So, we’ll see. JUAN GONZÁLEZ: Congressman, I’m wondering now, as this is 16 years now in the House, prior to that as the mayor of Cleveland, any misgivings about things that you were not able to accomplish, or, in the same way, pride in things that you were able to accomplish, especially in the House, all these years that you’ve been seen as the conscience of the House? REP. DENNIS KUCINICH: Well, I will say that it’s really unfortunate that the—that the Democratic leadership in the House did not support an impeachment effort to challenge the Bush administration, and Mr. Bush and Mr. Cheney, on the lies that took us into war in Iraq. That was a pivotal moment for this country. And instead of choosing the Constitution, our leaders chose politics. Bad choice. The fact is that today, after a decade of war, we are looking at an eventual bill for that Iraq war of $5 trillion. We’re looking at perhaps as many as a million innocent civilians perishing—for war that was based on lies. People have to remember this. This isn’t just because it’s, you know, forget about the past. No, you cannot forget about the past. We went to war based on lies. And so, you know, I did my part, which was to alert the Congress back in October 2002: Look, we’re headed into a war, and there’s no proof that Iraq has anything to do with 9/11 or had weapons of mass destruction; what are we doing here? But we were pulled into that by the Bush administration, driven by neocons and the Project for the New American Century. All of us who were following it know exactly what happened. And, you know, that set the stage for where we are today. We’re at the—you know, if there is such a thing as a fiscal cliff, we’re at the edge of it because of trillions of dollars that will be spent for wars based on lies. And there was never any accountability. If there’s one thing we have to do, we have—America needs a period of truth and reconciliation, if we’re ever going to get—put the country back together again and achieve a level of national unity that we’re capable of. But right now we’re living on a lie. And the lie is that—that this whole national security infrastructure is necessary and that it’s necessary for us to keep expanding war around the world, it’s necessary for us to have these big spy agencies, which also interact domestically. All of this stuff shouldn’t have happened. And we made the wrong choices. And this is a problem for both political parties to resolve. You can always try to fix things, but you have to look at the severe impact that our inability to act, to challenge the lies that took us into war—you have to look at where it’s left us. AMY GOODMAN: Congressmember Kucinich, why is it that it seems like so few tea party Republicans can control the Republican Party in Congress, and yet the largest caucus of the Democratic Party in Congress, the Progressive Caucus, has so little effect or say? REP. DENNIS KUCINICH: Well, I think, first of all, for those who are doing the daily work inside the Progressive Caucus, they should be appreciated. Raúl Grijalva and Congressman Ellison, you know, they’ve done a decent job of keeping a progressive agenda out front. However, you know, some members will choose affiliation with the Progressive Caucus as kind of a social function more than a political function. So the membership of the caucus belies the fact that once Democrats are voting on the floor of the House, you know, it doesn’t matter what caucuses they’re involved in. It’s like a social thing. What matters is they’re responding to the aspirations of their—of their constituents. And that’s why—you know, I go back to what I said a moment ago. You know, it may be that instead of people going outside the party and saying, you know, “A curse on both your houses,” that you come—that we get people coming back inside the party and start to bring primary challenges forward on both sides of the aisle to shake up the political equation so that parties really do reflect a little bit more of the involvement and the aspirations of people at a local level. I mean, the tea party knew what they were out to do. But the Democratic Party hasn’t shown the same kind of discipline or willingness to take a stand on some of these basic issues that ought to describe who we are, like Social Security, like single-payer healthcare, like keeping people in their homes, like a full-employment economy, like ending the military buildups and the war machine. I mean, you know, there’s still plenty of room for us within the party to negotiate that, if people feel there’s still a chance to do that. AMY GOODMAN: Congressmember Kucinich, very quickly, news just in of another shooting, this in Camden County, New Jersey, three police officers shot. It looks like there are no deaths at this point. The shooting happened around 5:45 this morning, Eastern time. The power of the NRA? And also, do you see yourself getting involved with third-party politics; as you leave, what your plans are? REP. DENNIS KUCINICH: You know, I’d love to be involved in two-party politics, but we don’t really have that right now. I think that this ubiquity, ubiquitousness of violence in our society isn’t just about guns. We have to look at the culture of violence that we have in America and deal with it in a way that isn’t about beating ourselves up, but we have to look at the spectrum of violence—domestic violence, spousal abuse, child abuse, violence in the school, gang violence, gun violence, racial violence, violence against gays, and the police community challenges that come up. And in doing that, that’s why I called for, years ago, a Department of Peace, not to simply create another federal department, but to have an organized approach nationally to deal with the violence in a society, to help families deal with the tensions that they have at home, to deal with some of the fundamental attitudes people have, boys might have about girls, and, you know, through education. We need to take a new approach. And frankly, you know, we can get rid of all guns; we’re still going to have violence. Now, I have never supported the NRA. I probably have, you know, a zero rating with them. But the fact of the matter is that we have to take a much broader view. Again, the debate is too narrow here. It’s—we need to look at the cultural issues, that are real. And when you talk about gun control here in America, and at the same time you’re talking about gun expansion across the world, about not only the United States exporting arms to the world and engendering wars everywhere, but our own efforts proliferating wars, that’s kind of a mixed message that inevitably is not easily reconciled. So we need to build a culture of peace in America. Is it possible? Of course it is. You know, violence is a learned response. So is nonviolence. And so, through education and through creating a social health safety net, I think that we can meet the challenge. And that’s one of the things I’m certainly going to be involved in as I leave the Congress, to try to broaden the debate, to look at this in a way that’s compassionate and at the same time not blaming ourselves, but recognizing that we have a culture that is very violent and that affects Americans at every level. And if we address that in a systematic way through an organized approach, using the resources and assets of government at all levels, I think that we could find a way to change from where we are today with this dismal record of one shooting after another and all the, you know, innocent people and public servants constantly being under attack. AMY GOODMAN: Congressmember Kucinich, we want thank you very much for being with us. Dennis Kucinich, eight-term congressmember from Ohio, serving his last week as a member of Congress. We will look forward to talking to you in your new capacity, whatever that will be. REP. DENNIS KUCINICH: Thank you. AMY GOODMAN: This is Democracy Now!, democracynow.org, The War and Peace Report. When we come back, we look at the Wilmington 10. Why are so many calling on the North Carolina governor to pardon them. We urge you to listen. Stay with us. Jeremy Scahill and Dennis Kucinich: In Obama’s 2nd Term, Will Dems Challenge U.S. Drones, Killings?